Here is a general list of what size riveters will install which size shank rivets. Note: These are approximations as a general guide. Sizes may vary a little depending on the material of the rivet you are using and the material you are installing the rivet into. Rivet Busters are used for removing rivets by cutting the rivet heads off and for the most part used to be used in the bridge and structural industry. They are commonly used now for busting up concrete and horizontal work in tight areas because they typically hit slower than a jack hammer or pavement breaker and are more controllable in small areas. They are also considered alternatives for pole driving and fence work because there handles can sometimes be switched out from D style handles to T style handles. Busters can be used with a special bit sold separately upon request for posts and ground rod driving. Rivet busters have been proven to outlast some breakers, clay diggers, or demolition hammers doing the same job. There are generally 2 common sizes of this type of tool 9” and 11” size. They typically take one of two sizes of bits which can vary in style depending on what you are using the tool for. The two sizes are called 1500 series and Jumbo aka 2000 series. 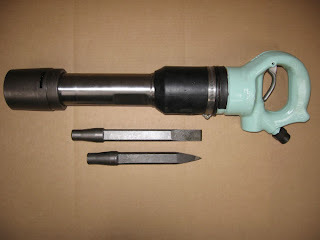 Both size tools can use both size bits by using adapter sleeves in the end of the tool but typically adapter sleeves that convert a tool using 1500 series bits into a tool that uses 2000 series bits will wear out faster since the sleeves are generally thinner to accommodate a larger bit in them. 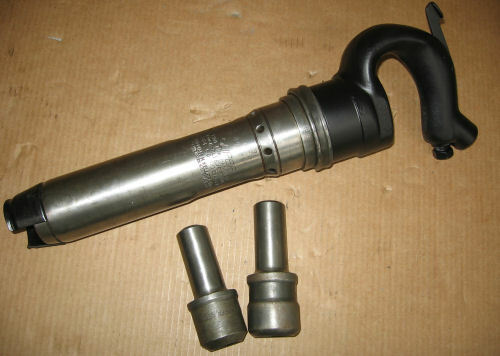 Common bits purchased with this type of tool are flat chisels and moil point bits but blanks and core knock-out punch bits are also a style that can be used with these tools to know out rivets and large pins from structures or large equipment. Common “wearable” parts with these tools are Upper and Lower sleeves Retainers and Side Springs. They can usually be purchased separately.